HR in any organization can learn from Aon Corporation's cataclysmic September 11 experience. Evacuation drills and first-aid kits aren't enough anymore. HR also has to prepare a crisis communication plan. In Chicago, Melody Jones was attending an out-of-the-office meeting when she heard the news: a jetliner had just struck one of the twin towers of the World Trade Center. "I called my voice mail, and there were seven messages, all telling me to turn on the TV," she recalls. "We'd thought it was an accident, but then someone said, 'No, we're under attack.'" It was a moment in which millions of people across America and around the world were transfixed with horror. But Jones had no time for that. She is a vice president and chief human resources officer of Aon Corporation, a Chicago-based international insurance, risk-management, and consulting company, and more than a thousand of her company's employees worked in the shattered structure she had just watched burst into smoke and flames. She soon got a cell-phone call from an HR staffer, who told her that Aon's downtown Chicago headquarters was being evacuated out of fear that the terrorists would strike there as well. So Jones struggled through the traffic jam out of town to the company's satellite complex in suburban Glenview, where a conference room was hastily being equipped with fax machines and extra phones, to serve as a command center. As one might expect from a company in its field, Aon had sophisticated plans and corporate policies in place for dealing with disasters and emergencies. Even so, "nobody ant icipates something of this magnitude," Jones readily admits. "You just don't expect to lose an entire building in a disaster, and have hundreds of employees missing." The challenge that Jones and the rest of the Aon crisis-response team faced was daunting. Worried families and coworkers in New York needed to know what had happened to their loved ones and friends; Aon's injured and dead had to be identified; and the surviving employees had to be located so the company could offer them help. At the same time, for the sake of worried customers and investors, Aon had to pick itself up from the devastating blow and get its business operations up and running again as soon as possible. Aon would have to accomplish those difficult tasks in a city hundreds of miles away, where its surviving employees were wandering the chaotic streets with tens of thousands of other displaced workers, cut off from company e-mail, fax machines, and phones. "So we had to invent a new plan," Jones says. "With everything else down, we decided to use the company Web site. That seemed like the only option we had." As it would turn out, that strategy, though improvised, proved amazingly effective. And as the dust clears from the most devastating disaster in U.S. history, Aon's Web-based crisis response provides a model for other HR professionals to follow in preparing their companies for the worst. We all hope never to see another catastrophe of the awful magnitude of September 11--a terrorist attack that claimed more than 5,000 lives, destroyed billions of dollars in property, and wreaked havoc with transportation and communication systems. But all the same, the tragedy was a warning to companies that they must be ready for situations far worse than they had ever imagined. According to a survey of 5,700 U.S. companies conducted after the attack by the Society for Human Resource Management, only half even have a disaster-management plan in place. With war and the specter of more possible terrorist attacks on the horizon, that is likely to change in a hurry. "It wasn't in the forefront of our minds," says Christina Sunley, an analyst for Knowledge Point, an HR consulting firm, "but we know we have to be prepared now." HR professionals, who play a key role in emergency planning, have to be aware that evacuation drills and first-aid kits aren't enough. One of the most crucial--but too often neglected--parts of a disaster plan is how to communicate with the company's workforce in a crisis. One part of the challenge is to locate and re-establish contact with employees who may be scattered in the streets or suddenly stranded in airports around the globe. But that's just the start. Companies have to develop strategies for providing employees with up-to-date information about the disaster, access to services such as health coverage and grief counseling, and assistance in getting back to work. And they must convey messages from top executives, reassuring employees that they and the company will make it through the ordeal and guiding them through the stages of recovery. Lastly, companies have to be able to provide that help to people who in some cases are cut off from the company's usual channels of communication. Fortunately, HR professionals who face this new challenge also have an increasing1y powerful new tool at their disposal: the Internet. Though the devastation of September 11 reduced offices to wreckage, companies discovered that their online capabilities were remarkably resilient; auxiliary servers in other locations could take over for damaged hardware, and information-technology staff could create or alter Web pages from distant locations. "One of the great things about the Internet is that you can get to it from anywhere' says Linda Merritt, an HR strategic planning director at AT&T who worked to locate hundreds of their employees who fled the WTC and a nearby building after the attack (all of them survived). "We had a number of successes locating people via e-mail, because they were able to access our system from their home computers or other places where they could get access to a PC." In the wake of the September 11 attack, Cantor Fitzgerald, Morgan Stanley Dean Witter, United Airlines, and numerous other companies utilized corporate Web sites as a key part of their crisis communication. The uses were as varied as they were ingenious. Merrill Lynch, whose headquarters was destroyed in the attack, auto-dialed dislocated employees at home with a recorded message that directed them to a corporate Web site, which in turn helped them settle into temporary office space elsewhere in New York and New Jersey. Marsh & McLennan provided a Webcast of a memorial service at St. Patrick's Cathedm1 for employees killed in the attack, so that those who couldn't attend had an opportunity to feel they were part of the service. Even companies that weren't directly affected by the attacks used their Web sites to deal with the pervasive shock waves. Reader's Digest, whose offices in New York and Washington were unharmed, used a site on its corporate intranet to provide employees with regular updates on news related to the attack. "We wanted to help people to get information they needed easily, so that they wouldn't have to spend all day on the Internet or watching TV," explains Susan Russ, RD's director of internal communications. In addition, RD used its site to organize and schedule a blood drive, and to make it easier for employees to donate to the American Red Cross and other agencies involved in the relief efforts-with the company double-matching their contributions. But Aon Corporation, in particular, provides a prototype for how a Web site can function as the nerve center of a company's crisis communications, and how the Web's flexibility allows those communications to evolve over the course of an emergency. Aon's response team immediately set the company's fast priority--finding out the fate of the employees who'd been in the WTC at the moment of the attack. 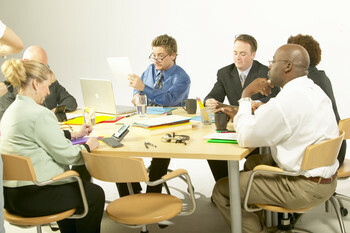 The company quickly manned a phone bank and started the laborious task of calling employees' home numbers in the hope of locating them. At the same time, Aon established a toll-free number that employees and their families could use both to get information and to share it; the number also routed people to crisis support centers that Aon quickly set up at hotels in New York and nearby suburbs. But the crisis team also saw that the company needed a quicker way to reach out to many people at once, and to provide a fuller range of services and information. Normally, Aon uses its sophisticated "Knowledge Exchange" intranet for internal communication. But in their haste to flee, survivors most likely hadn't taken their company laptops with them, and so they didn't have the special security software they needed to access the network. So Aon's team hatched another solution--using www.aon.com, the publicly accessible Web site that the company had set up for marketing and external communication. By 1 p.m., Kevin Mayes, Aon's director of Internet communications, had created a new home page with information for employees and their families. Mayes and his technical team kept working through the night, and by the next morning, the site had been totally redesigned as a portal for crisis communication.